Lord of the Sword is one of the early RPG games released for the Sega Master System, but if you think that means sickeningly cute looking little men and women with blue and pink hair running around with cheesy grins on their faces you should look elsewhere - Lord of the sword is game that takes itself a bit more seriously than that. I remember my sister received this game in 1988 as a birthday present (but wasn't long before i nicked it) and remember being really confused as to what I was supposed to be doing in this game, actually reading the text at the start of the game, telling you about the 3 tasks you must do in order to be crowned king of Baljinya, it was actually pretty clear, but it can be a little frustrating figuring out exactly where you have to go in this game, the map that comes inside the instruction manual isn't exactly helpful. Underneath the story line of the game Lord of the sword is basically a side scrolling hack 'n slash adventure game similar to Captain Silver that has had RPG elements and quests added to it. 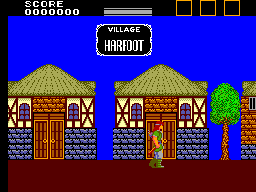 You start off in the village of Harfoot with your sword and bow(the bow is awesome and very well done), and naturally being an adventurer you want to try and become king of the land. You are give the three tasks at the start of the game, but theres much more to be done than three tasks. First up is the book of evil, you have to collect it from the Wizard in Amon, and then take it to Mount Morgus and cast it into the lava in order to destroy it. It can be quite funny sometimes because there are enemies called "book theif" who will actually try and steal the book from you! If this happens the game is not over, but you don't get the book back, I have never completed the game after the book has been stolen, so if anyone can tell me what happens in this case it'd be great to hear from you. Another task you have is to find the royal symbol, which can only be found by destroying the tree of Merill. But first you must speak to "the tree people" to find out where the tree of Merill is located. Hmm talking trees and items that must be destoyed in mountains of fire, while being chased by people after the book, Is anyone seeing any similarities to J.R.R. Tolkien's masterpiece here? This game is pretty huge it has to be said, which brings me to the games major flaw, the lack of a save game feature. The game only takes about 3 hours to complete if you have already played the game through, but if you don't know exactly where you are going then you will find yourself leaving your Master System switched on paused mode overnight for sure. The game can be annoyingly frustrating at times, tasks must be performed in a very specific order so that certain other events will happen, for example you still have to ask the tree people where the tree of Marryll is even if you already know otherwise it just won't be there. You basically find yourself wandering around from area to area until you come to the correct area and a new even unfolds. A very cool part of the game is the battle with the Necromancer at the swamp just west of Pharzon, you must hit the mirror on his chest with your bow, this character I thought was great. Occasionally after doing certain quests you will be given new weapons as a reward, its a shame the look no different, but you will notice that it takes less hits to kill certain enemies with certain weapons. 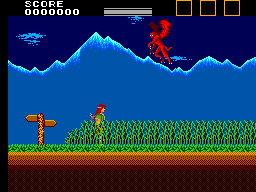 Another great part of the game is the battle with the Giant pirate on the Isle of Falas, who you must defeat in order to please the mayor of Lindon, there is also a "duel" in the game too, where you must fight off many unique enemies one after another in order to get the potion to destroy the statue of evil. This brings me to another bug in the game I have encountered, I have finished the game many times, but never have I actually been able to fight the statue of evil, in fact after getting the potion to destroy it, going to the location where the statue is (west of Harfoot) to find that it is simply no longer there. I have spoke to other people who have said they did battle with the statue, if you can confirm this please email me at the above address. Despite the bugs, and lack of save game feature there is enough variety in this game to keep it interesting enough for the time it takes to complete, I hear of many people playing this game, but very few have said if they have completed it. Trust me - playing this game is actually a really rewarding experience, you just must have patience. In my opinion the graphical appearance of the game itself is fantastic, the graphics serve their function very well and are very similar to the style in which Captain Silver was made, There really are a great deal of unique enemies and creatures the inhabit the lands, from the walking skeletons (Jason and the Argonauts anyone?) to the giant spiders & floating eye-balls, this variety keeps the game interesting, and there are also a diverse range of backgrounds such as plains, forests, caves, catacombs, towns etc in which the action takes place, this game had it all years ahead of its time. There are also some really good still screens where there is text, my personal favourite is the end screen where you see brave king Landu looking into the sunset. One of the games weaker points is its sound and music, there are really only five tunes you will be hearing throughout the course of the game, the title screen music, the main adventure music, the boss music, the maze music and the death music. The music is all well and fine, and is very much in the same spirit as the game, but the main adventure theme does get a bit repetitive as this is what you will be hearing most. I guess they used up most of the cart's memory on graphics and animations. Controls for the game are good but by no means perfect, the most annoying thing is pressing up on the D-pad will make the character jump, holding button 1 will make him fire is bow (holding button one will keep an arrow in the bow waiting to be released when button one is released) and button 2 slashes with your sword. The thing is you cannot walk and slash your sword at the same time, or fire your bow, also pressing in the direction you face and pressing button 2 will also make you slash your sword quicker, this is hand for the tough enemies like the Pirate of Falas. I'm afraid this game is just another victim of the Master systems two button limitation, three would have been perfect in order to assign a button to jump rather than using the D-pad. But saying all this, the game still plays very well with the control set-up it has and is still very enjoyable. 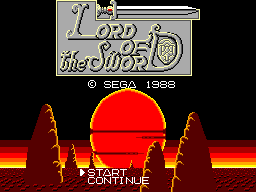 Most people would not even consider playing an RPG game more than twice, Lord of the Sword is a game I have completed around twenty times since owning it. And I could still play it again. Once you get over the games steep learning curve it really is a great game. I think because the game is not a traditional Japanese RPG its also much easier for me to stomach. Lord of the Sword is a game many people overlook, due to the daunting size of the task without a save feature, I would say because of this many people have deprived themselves of a great gaming experience, if only they would give the game a chance I'm sure they would come to see Lord of the Sword for the great game it is. Sure the game is by no means perfect, but its far superior to other "RPG" games such as the terrible official Dungeons & Dragons game "Heroes of the Lance". Please give this game the chance it deserves! You will wander around for a long time, but once you have finished it you will feel a great sense of achievement for finishing this mammoth of a game that few people dare touch.